In January, two US Navy high speed Riverine boats were apparently underway from Bahrain to Kuwait when they strayed into Iranian waters, while attempting to contact a vessel to refuel. The Pentagon first said that they had engine trouble. Yet, if that was the case, why didn’t the other boat tow the boat with mechanical problems to international waters and safety? Then, the Pentagon said that they had navigational issues. How is this possible in 2016, with each boat having an array of GPS and radar equipment? Even if one boat’s systems completely shut down, couldn’t they rely on the other boat’s GPS or radar? Lieutenant David Nartker, commanding officer of the two US Navy Riverine boats, surrendered his men and his craft with superior firepower to a half dozen Iranian thugs in bass boats that looked like they belonged on Bill Dance’s fishing show. Nartker surrendered without firing so much as a flare. After boarding the Navy boats, Nartker and his men were ordered down on their knees while the Iranians trained machine guns and cameras on them. Nartker doubled and tripled and quadrupled down on his disgraceful conduct by apologizing to the Iranians for a worldwide TV audience. 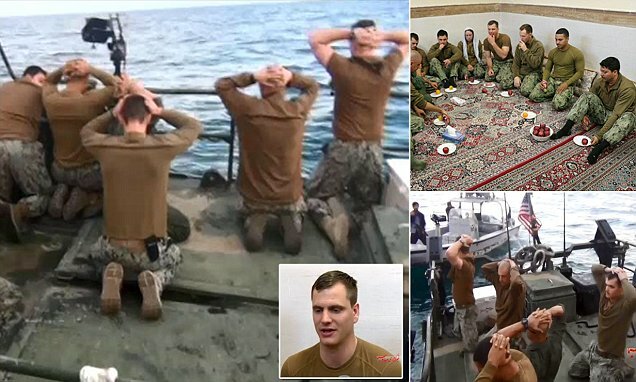 To add insult to injury, one of his men felt it was an opportune time to start bawling his head off like he was a guest on Oprah, letting the Iranians and everyone on the planet know that US Navy sailors of 2016 are not made from the same mold as the guys who won the Battle of Midway. Lieutenant Nartker’s first action, to surrender his boats and personnel without offering any resistance is a violation of the US Military’s Code of Conduct, Article II, which states, I will never surrender of my own free will. If in command, I will never surrender the members of my command while they still have the means to resist. Congressman Forbes’ revelations only increase the amount of speculation about what exactly took place in the Persian Gulf in January. What is so sensitive that the Pentagon and the White House refuse to release to the American public? To begin with, we don’t know exactly why the two US Navy Riverine craft were in Iranian waters. When confronted by the Iranians, why did Lieutenant Nartker surrender his boats and men when he had superior firepower and equipment? Was he ordered to surrender by his superior officer, Commander Eric Rasch, who was relieved of command this week by the Navy? Or, did Nartker panic and decide to surrender? Did the Iranians abuse the sailors while they were in custody? They were apparently interrogated, but none of the sailors looked like they were physically abused. Was the female sailor raped? If she was, and it’s being covered up, it wouldn’t surprise me as the Pentagon makes its case for throwing America’s daughters into combat. Were the men raped? It’s not that uncommon in the Middle East. Remember what happened to Lawrence of Arabia when the Turks captured him. Did the Iranians threaten to kill Lieutenant Narkter if he didn’t answer questions favorably, when he was interviewed on Iranian TV? What kind of technology did the Iranians steal from the boats? The fact that Commander Rasch was relieved for not providing effective leadership, lends me to believe that Narkter’s decision to surrender may have been his own. Nartker’s lack of fighting spirit and the apparent ignorance or avoidance of the Code of Conduct by he and his men, speaks volumes about the state of the US Navy. The Iranians might have pushed some of the sailors around and threatened them, but none of the sailors looked like they had suffered from anything except indigestion from the Persian food and a really first rate case of cowardice in the face of the enemy. Lieutenant Narkter may have indeed been threatened by the Iranians, but he should have refused to be interviewed by the Iranians, even if that meant he would have been physically abused. Captured Americans in the Hanoi Hilton would undergo torture for months and perhaps years, before they broke down. Nartker cracked in less than a day. Think about that. There is no doubt the Iranians conducted themselves like the thugs they are. The true smoking gun most likely concerns the disgraceful conduct of the US Navy during the incident and the obscene groveling by John Kerry upon their release. The Iranians are the enemy of this nation. They are nothing more, nothing less. Iran will remain an enemy of the United States until the Mullahs are destroyed in a hail of revolutionary gunfire or by the inevitable bombs from Mr. Netanyahu’s Air Force. As for the US Navy, it is a sad product of the social engineering that is eating the military alive like a Stage 4 cancer. Under Obama, the US Military has become the new wimp on the block. This would have never happen with this type of outcome when i was in.do you hear that sound deep in your gut,it’s the sound of laughter from CHINA AND RUSSIA for the usa wimps. Another John Kerry in the making. This is not the Navy I served in! The LT should be Court Martialed for cowardice. History shows the opposite; we are the enemy of Iran, and, have put teeth in our enmity many times. They had a revolution to take out a tyrant we put in to replace a duly and democratically elected leader. Very democratic, very amerikan. My Father was a Naval Commander in WWII; my Brother-in-Law was a Naval Combat Pilot, (later a U2 Pilot, crossing Russia, from Incirlic Turkey), in the Pacific in WWII…And NEITHER of them EVER even suggested that they’d simply surrender, and “assume the position” willingly, if they’d been captured…They were GENUINE WARRIORS! There’s a very REAL CHANCE that our Military are now “targets of opportunity”, due to B.O. [duh stink’a uh D.imwit C.ity], and his enemy loving rhetoric and policy making. These men are NOT wearing navy utilities. smells to high Heaven ! All over the world the sodomites are taking over. Men, uhh, I mean only boys cry like that when they have been raped. As Rob states that LT should be Courts Martialed. But then so should John Kerry have been Courts Martialed for his actions coming fm VN. Where is my reply? There were no replies here when I posted. Does this military oriented website follow the spirit of the Constitution that you all swore an oath to not just uphold, but defend, or does it use the heavy hand of authority, i.e., I do what I have the power to do regardless of whether or not it is right? Is it light or is it power?